Are your products available in the virtual world? Content can be found by Brand, Category and through the search function. Your logo will be attached to each of your items, giving maximum exposure at every opportunity. Our cloud-based delivery system ensures your current product catalogue is available to users. is the future of building design. Increasingly, designers use BIM to create fully-featured buildings in the virtual world long before construction begins. They use virtual 3D models of real-life products to ensure their clients are happy and confident with the final design before significant investment is required. Your products as 3D models for the BIM environment will give you increased sales opportunities. BIM allows Designers and Architects to place your products in the 3D environment, providing them with the opportunity to present your Brand to customers.  QARC will create and maintain your library of 3D design content with associated specification allowing designers to easily specify your products in their projects. 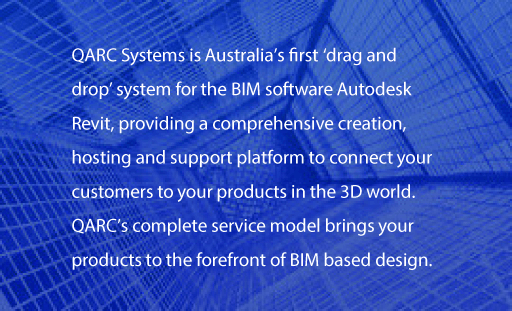 QARC will host your BIM library ensuring designers have easy access to your product models. 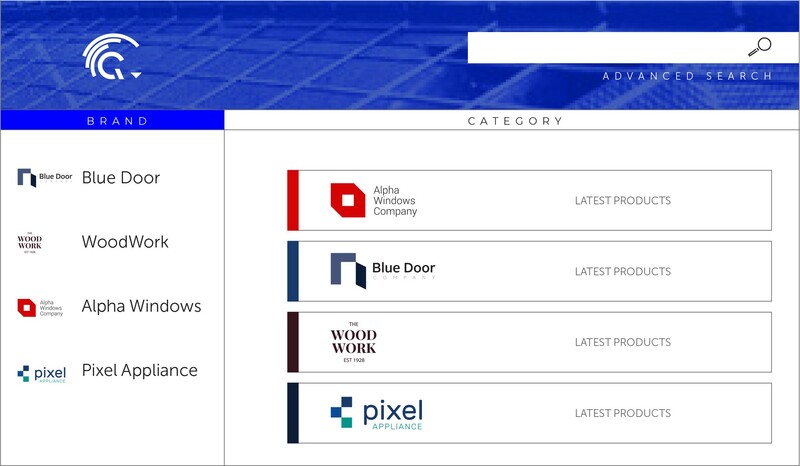 QARC will create advertising and promotional opportunities within the BIM environment to increase your online brand presence and enhance your exposure to key decision makers. 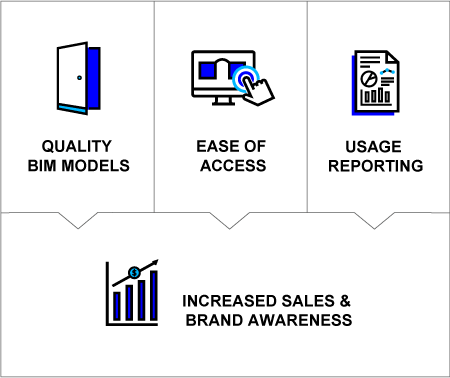 QARC will provide valuable business reports and statistics about the performance of your products in the BIM environment. Your products are of the utmost importance to us and we take every opportunity to promote your brand. Users will see your products daily, reinforcing the availability of your innovative solutions and encouraging their specification in designs. Further opportunities are available to promote new or existing products to Architects and Designers at the start up page and in the QARC menu ribbon. Premium content packages offer the manufacturers the advantage of their own virtual plug-in within the menu ribbon. This will give users instant access to the premium manufacturer’s products. Fill out form below, to request a Quote!